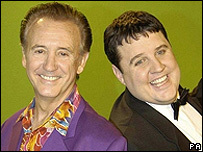 Tony Christie's (Is This The Way To) Amarillo was the best-selling single of 2005, according to Radio 1. Christie spent seven weeks at number one with the million-selling charity song, which featured comic Peter Kay. It beat the Christmas number one That's My Goal - rushed into production after Shayne Ward was proclaimed the winner of the X factor - into second place. 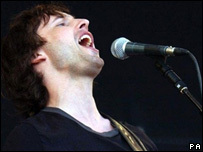 James Blunt's album Back to Bedlam was top in the end-of-year album charts also aired on Radio 1 on Sunday. The Crazy Frog's Axel F - the first mobile ringtone to make it into the charts - was at number three in the singles chart. It spent four weeks in the top spot during the summer. Former army officer Blunt had been at number one for five weeks with his ballad You're Beautiful, but came behind the Crazy Frog in the end-of-year chart. Other top ten singles included Pussycat Dolls' Don't Cha, Westlife's You Raise Me Up, Nizlopi's JCB Song and Madonna's Hung Up. In the album chart, Blunt's Back to Bedlam held off competition from a number of Mercury Award prize nominees for the top spot. Coldplay was at number two with X&Y, Kaiser Chiefs' Employment was at number four and K T Tunstall's debut album Eye to the Telescope was at number seven. Robbie William's album Intensive Care came in at number three.